This article does beg the question of whether this is a real issue compared to other under-representation. While the public service initiative is with respect to the wide range of awards under the Governor General, I have looked at Order of Canada recipients. Under the previous government, there were efforts to improve representation with respect to regional representation (e.g., under-representation in the West, over-representation in Ontario and Quebec) and under-representation of the business community (see my earlier The Order of Canada and diversity). 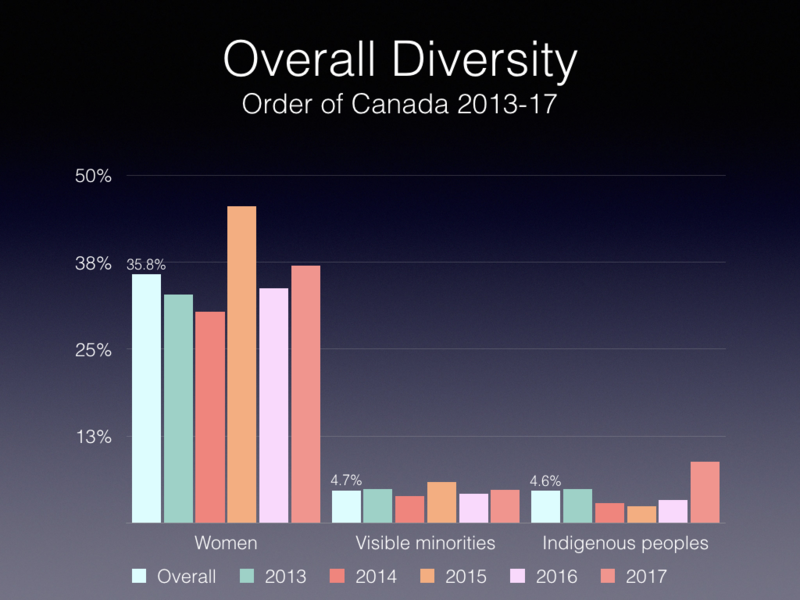 Recently, it appears that Indigenous representation has increased substantially, and is now greater than their percentage of Canada’s population. Visible minorities, reflecting in large part their relatively newer presence in Canada, but also likely some network effects of not visible minorities, remain under-represented. And women’s representation seems to have plateaued at about one-third with a few exceptions. The Liberal government wants to see more medals pinned on the chests of public servants, and so has established a kind of quota system to make sure they’re nominated more frequently. Michael Wernick, clerk of the Privy Council and Canada’s top public servant, has pressed all federal departments to submit the names of at least five of their employees each year to the Governor General’s office for various awards. “We encourage you to task the senior managers responsible for employee recognition within your department to begin nominating at least five public servants per year for Canadian honours,” says a letter co-signed by Wernick and Stephen Wallace, then-secretary to the Governor General. The fall 2017 missive to deputy ministers, obtained by CBC News under the Access to Information Act, was followed up last year directly by the Governor General’s office to ensure departments were co-operating. “We look forward to hearing about your department’s strategy to recognize deserving individuals in your department whose achievements, contributions or accomplishments have made a difference or have had a positive impact on your organization,” says an email from Sylvie Barsalou, administrative officer with the Chancellery of Honours. The Liberal government initiative was triggered by an internal assessment that concluded public servants historically have been “underrepresented” within the Canadian Honours System, which includes a broad range of medals and decorations. “[W]e are taking steps towards reversing this phenomenon,” says the Wernick-Wallace letter. A spokesperson for the Governor General cited statistics for the Order of Canada, one of the Government of Canada’s highest honours, to support the claim that public servants are underrepresented. 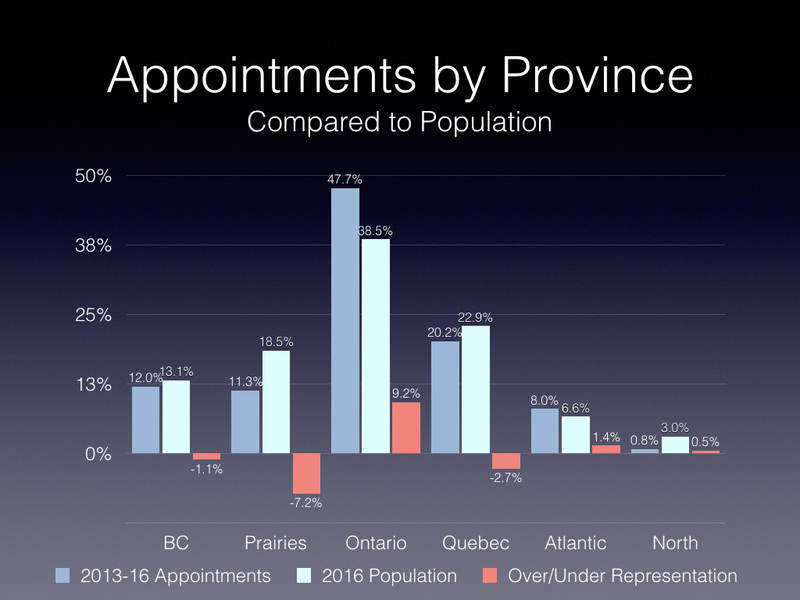 “Between 1976 and 2018, people whose contributions were considered ‘public service’ made up, on average, 2.4% of annual appointments to the Order of Canada,” Sara Regnier-McKellar said in an email. The phrases “public service” and “public servants” in this context, she said, refer to those working in all kinds of governance and government, including Indigenous governments and municipal, provincial and federal governments. The impact of the new nominating initiative is unclear. Both the Governor General’s office and the Privy Council Office (PCO) say they are not counting nominations submitted by federal departments. “We do not monitor or track nominations and have no plans to do so,” said PCO spokesperson Stephane Shank. “It is anticipated that most nominations will be submitted for the Meritorious Service Decorations,” says the note, also obtained under the Access to Information Act. There’s no shortage of other awards specifically reserved for federal public servants. The annual Public Service Award of Excellence, for example, recognizes five categories, including “outstanding career.” There were 123 recipients last year (131 in 2017); each one receives a medal. Canada’s new information commissioner, Caroline Maynard, also created a new award last year for access-to-information officers, selecting two employees (at the Canada Revenue Agency and the Canada Border Services Agency) as the inaugural recipients. The Governor General’s office alone is responsible for 13 categories of national awards, and lists a total of 413,526 people in its database of previous and current recipients. 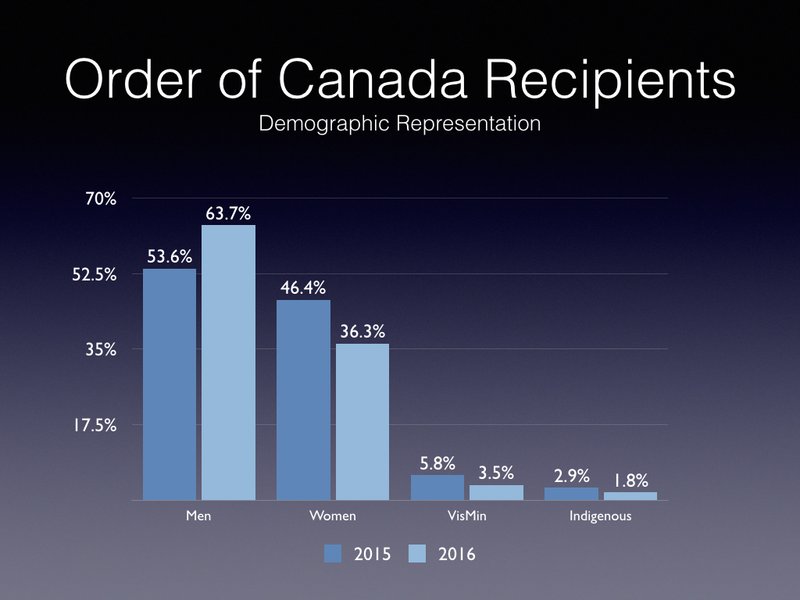 For those that are interested, with the December 2017 Order announcements, I was able to update a number of the key charts from my earlier The Order of Canada and diversity. The first charts looks at the overall diversity of 953 appointments, broken down by year, for the last five years. 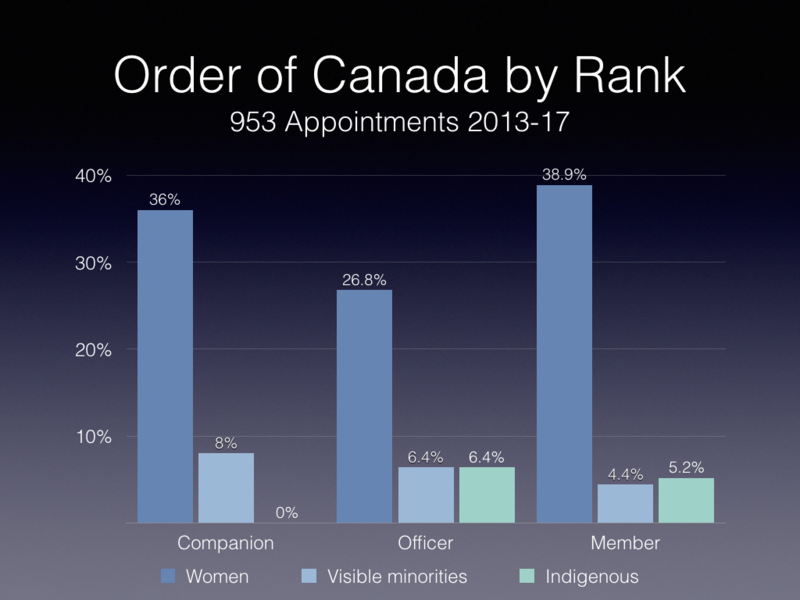 The most notable change is the large jump in the number of Indigenous peoples appointed to the order in 2017 (particularly the December appointments). 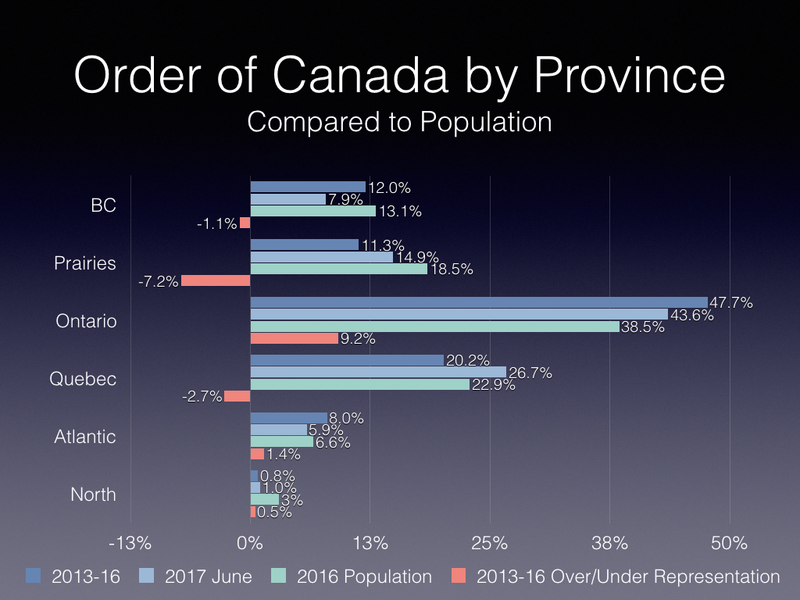 The second chart shows the provincial breakdown compared to the population shares, showing the historic pattern of over-representation of Ontario. 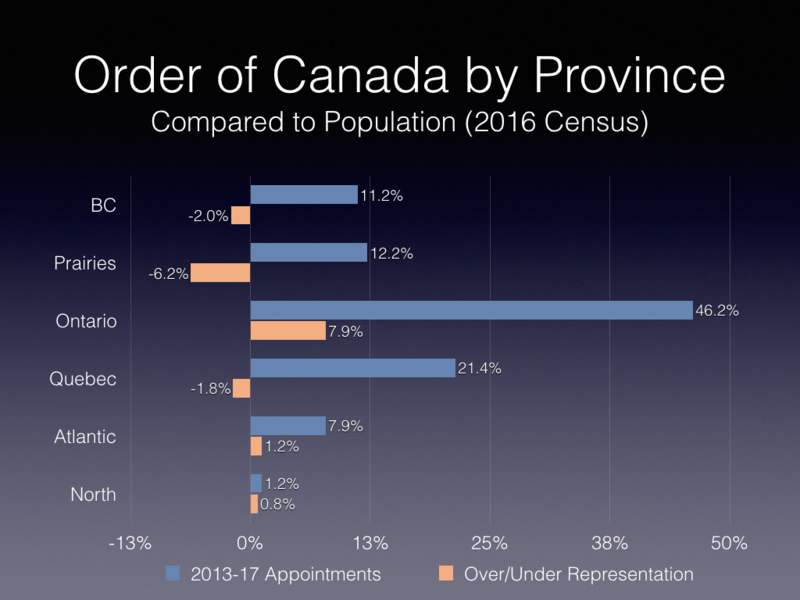 The third chart breaks down appointments by rank and group, showing slight relative over-representation at the officer level for visible minorities and Indigenous peoples compared to the ‘feeder’ group member level. While as noted in the article, there are a number of factors that make Order of Canada appointments an imperfect indicator for diversity and inclusion (i.e., nomination driven process, regional balance considerations etc) it nevertheless provides a sense of how the contributions of three employment equity groups are publicly recognized. Two charts contrasting the 2013-16 baseline with the latest appointments, which should start reflecting some of the changes and additional funding announced in Budget 2015 to improve under-represented sectors, understood as Western Canadian and business-related appointments (see my earlier article in Policy Options The Order of Canada and diversity). The list includes soccer star Christine Sinclair, television host Alex Trebek, actor Catherine O’Hara and Globe and Mail editorial cartoonist Brian Gable. The Order of Canada is considered one of the country’s highest civilian honours. It was created in the centennial year of 1967 to recognize outstanding achievement and service to the community. More than 6,700 people have been named to the Order in its 50 years. Another illustration of the differences between Australia and Canada: this article highlights in a positive sense that 1.6 percent of the Australian honours list (equivalent to the Order of Canada) are from visible minorities or Indigenous peoples (or have made major contributions to these communities). The list of almost 900 Australians included a dozen honoured for their contribution to Indigenous Australia and fourteen honoured for their contribution to multiculturalism and diversity. In Budget 2015, the then Conservative government announced additional funding of $13.4 million over five years and $2.8 million in ongoing funding for the Canadian Honours System. 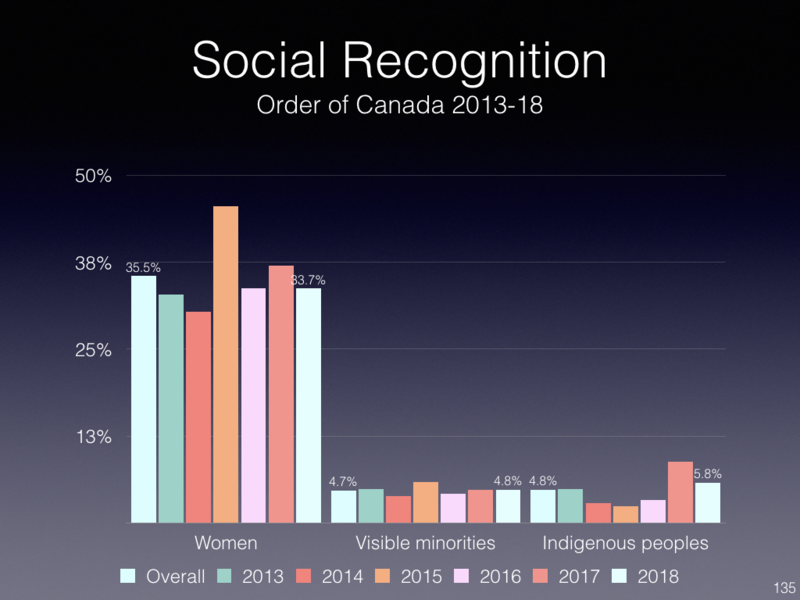 This aimed to “bring [honours] closer to all Canadians” by increasing the number of Order of Canada nominations from “under-represented sectors” (e.g. business) and regions (i.e. the West). 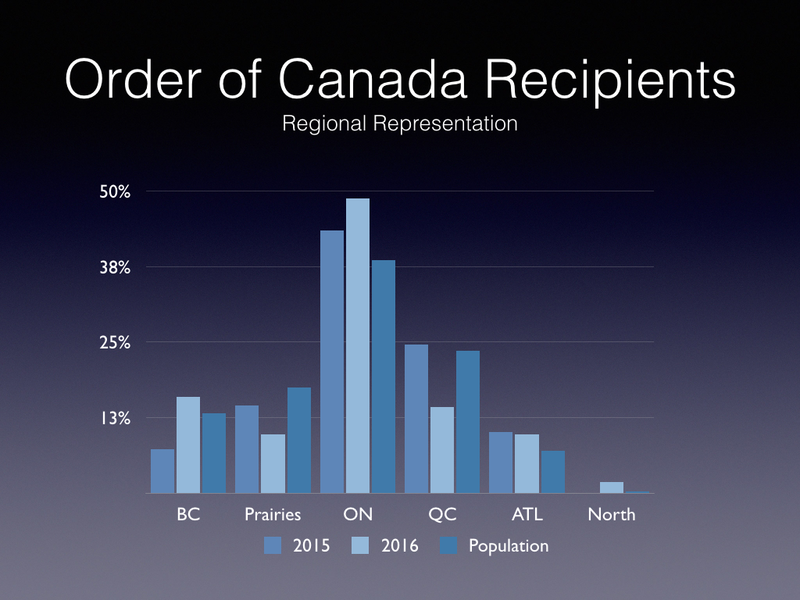 This was prompted by an Ottawa Citizen analysis that showed only 26 percent of recipients since the Order’s creation in 1967 came from the West, compared to the region’s 31 percent share of the population. 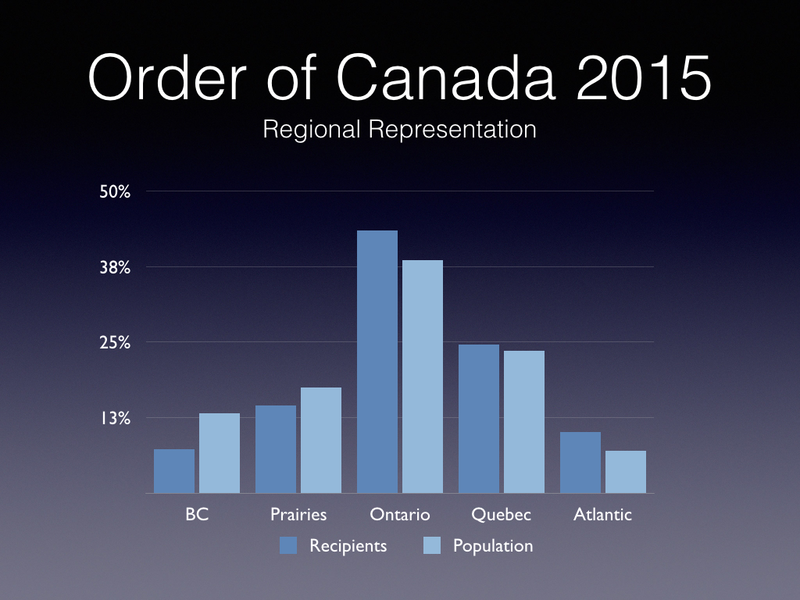 In contrast, Atlantic Canada had 11 percent of recipients, about twice its share of the population. Moreover, the study showed an increasing percentage of awards had gone to those active in the arts while the share going to business people had declined. The above slides analyze this year’s appointments along with last year’s for comparison purposes. the share of women declined substantially. 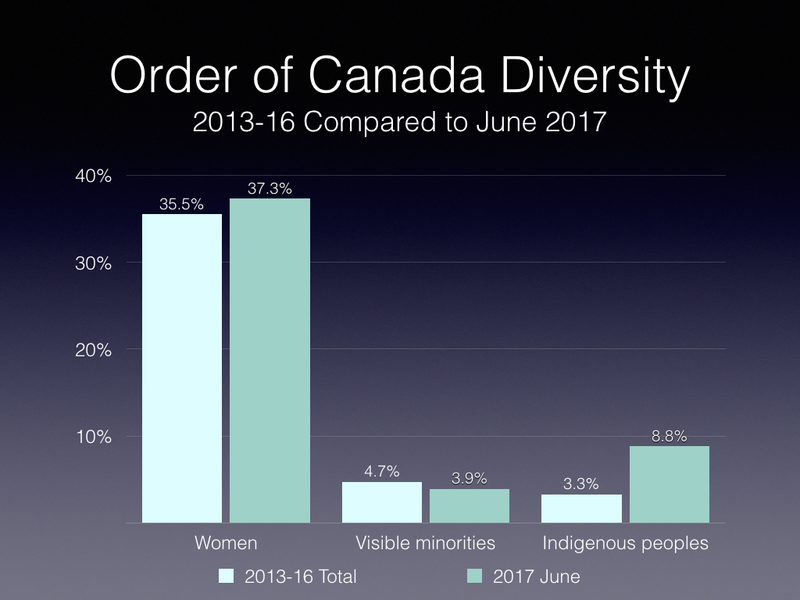 Although visible minorities and Indigenous peoples data is less certain (based upon names, short cvs and photos), representation of these groups also appears to have declined. As these are not under the direct control of the government, and the lengthy nomination and appointment process, it is not surprising that this year’s appointments do not reflect the current government’s diversity and inclusion agenda. Media commentary largely focused on gender and regional diversity as can be expected. The lengthy process involved (about a year) means that this largely took place under the previous government (although the process and decisions are under the GG). Looking at gender, indigenous and visible minority representation, both women and indigenous representation are relatively close to their share of the population. 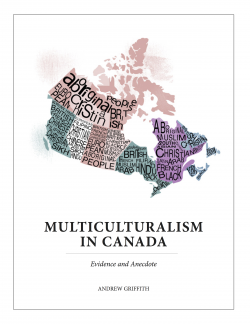 However, visible minorities, whether measured against the overall number (19.1 percent) or the number who are Canadian citizens (15 percent), are under-represented at 5.8 percent. (Note: this analysis was based on names and descriptions and not correlated against photos and thus may understate representation). 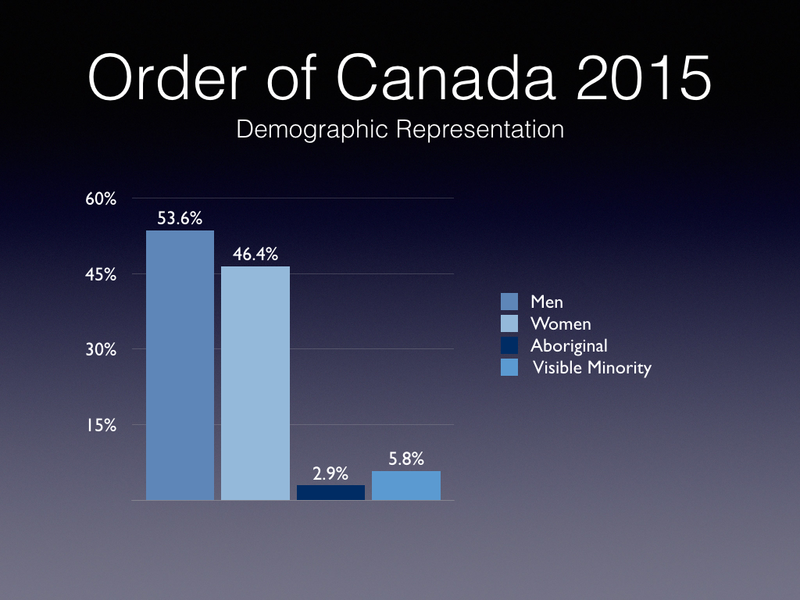 This is not surprising, given that visible minorities have a shorter history in Canada than other ethnic groups and thus less time to make the kind of contributions that the Order recognizes. But, like other open nomination processes, it may also reflect fewer nominations, in turn reflecting less awareness among visible minorities regarding the Order. Hard to say without more data but suggests that more outreach to get more nominations may be warranted.